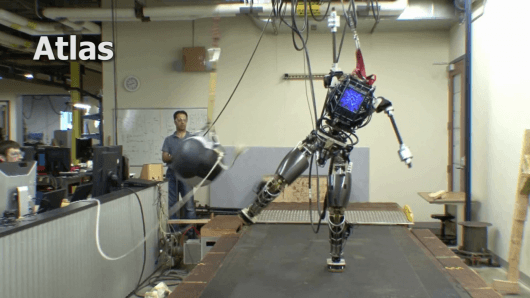 DARPA has revealed the completed ATLAS humanoid robot, which is to star in the upcoming DARPA Robotics Challenge (DRC) – and it cuts a striking figure. Designed by Boston Dynamics (the guys behind the BigDog,Cheetah, and LS3 quadrupeds), it’s being given to the top teams that recently competed in the Virtual Robotics Challenge (VRC). Now those teams have less than six months to fine tune their software with the real robot before they face the first of two live challenges. Standing 6 ft 2 in (1.88 m) tall, and weighing 330 lb (150 kg), ATLAS towers over most people. To put that into perspective, the HRP-4, a Japanese robot designed to work alongside people, stands just 5 ft (1.5 m) tall and weighs a scant 86 lb (39 kg). It’s the heavy-duty sibling of the company’s PETMAN robot, which was designed to test chemical protection suits. Like its quadrupeds, Boston Dynamics’ engineers opted to go with hydraulics for powering its 28 joints, so it is equipped with a hydraulic pump and a thermal regulator. Hydraulic power gives it a lot more strength than the electric motors found in most other humanoid robots, but the trade-off is they’re a bit more difficult to control. In turn, ATLAS is also power hungry, requiring a tether for its 480 V three-phase power at 15 kW and for its 10 Gbps Fiber Optic Ethernet networking connection. It carries its own real-time control computer, but it will be fed commands by human operators. The robot also contains parts developed outside of Boston Dynamics. Some of ATLAS’ height, for example, comes from a large sensor head with LIDAR and multiple cameras developed at Carnegie Mellon University, while its four-fingered hands are provided by iRobot and Sandia National Labs. ATLAS is no pushover, and I mean that quite literally.